Betty Crocker Gluten Free Bisquick Pie Crust Recipe and Prize Giveaway! Exciting news! Comment on this post and answer the question “What food product would you like to see available gluten-free?” to be entered to win a prize package of gluten free products provided by General Mills through MyBlogSpark. The package includes an assortment of gluten-free products from your favorite brands like Betty Crocker, Bisquick, Chex and Larabar, a Betty Crocker Red Serving Spoon, recipes, and coupons! I will draw randomly from those who comment…contest period ends December 3, 2010. I will announce the winner here. As many of you may have discovered, Gluten Free Bisquick Mix is now available from Betty Crocker at your local grocery store. Yes! As an added bonus on the Betty Crocker website you can print off coupons for discounts on those great gluten free mixes. See below for my tested recipe version. I am very pleased with the taste, tenderness, and convenience of this recipe. Of course to make it even more convenient you could make multiple batches and freeze the dough. This pie crust will make enjoying your favorite pies and desserts possible for everyone. Preheat oven 400°F. Grease pie plate with spray or butter. 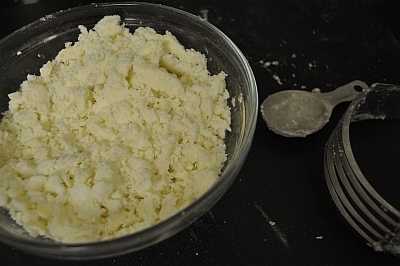 Use food processor, pastry cutter, or fork (or pull 2 table knives through mixture in opposite directions) to work the butter and cream cheese into the Bisquick mix until the texture resemble course crumbs. Add the vinegar and water and stir until dough comes together. Shape with hands and press into pie pan. 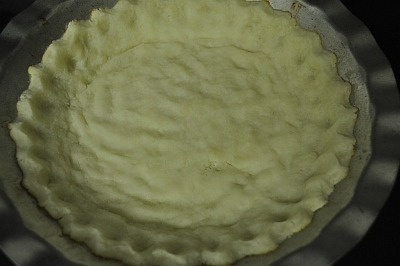 Press dough in bottom and up sides of pie plate. 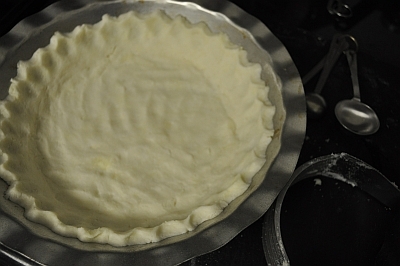 Protect crust with pie shield or strips of aluminum foil. Bake 10 to 12 minutes or until lightly browned at edges. Cool completely, about 30 minutes. Fill with your favorite pie filling and chill or bake according to the directions. 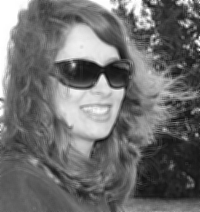 December 4, 2010: Our gluten-free prize package winner is Tina! Winners are selected by listing entrants in the order they are received and by using a random number generator. Every qualified entrant has an equal chance of winning. I love winning prizes, and I can tell you that it is even more fun to award them! Stay tuned for future contests. Great idea to get us lurkers to comment. Keep up the good articles! I don’t have challenges with gluten but have been eating healthier. Avoiding gluten is good for us “gluten-izers” as well. Thanks for the inspiration and help improving my health! I look forward to your posts and recipes. and the cocktail cracker (favorite brand/flavor is Glutino multigrain version). I have not yet found an adequate substitution for cheese crackers and so there is still lots of space in the gluten free marketplace for enterprising gluten free companies. I will try to put together a from scratch cheese cracker and get that out on the blog in the next couple of months. Yum. Anything with cream cheese is pretty much my favorite. Thanks for sharing this recipe. I’ll have to try it out. Your web site is looking great. I’m going to try some of the recipes. I want gluten-free Oreos! Or, a nice, soft, gluten-free hamburger bun. I fantasize about the feel a eating a greasy cheeseburger on a nice, soft, gluten-free bun. Thanks for the pie crust recipe! I am making coconut cream pie tonight and this will be perfect!! Good ideas! Schar makes GF Classic Rolls (Hamburger Buns) that are notch above any others I have tried. Be sure to warm them in the oven at 350 F for 5 minutes, and I believe they will scratch your itch. Speaking of scratch, I’m working on a bun recipe I believe will be even better. I’ll post it when I’ve optimized it. I hope everyone enjoyed your coconut cream pie! Udis makes great burger buns….I’m not a big fan of Schar…. Udis I keep in the freezer and put them on the top rack of the grill when I need them…. thanks for the updated link. I’ve tried the gf bisquick too. I did enjoy the biscuits I made from the box, still long for the flaky gluten version! I’ll have to try the pie crust recipe, thanks!! I agree Lori! Flaky biscuits are delish. I have discovered in my research that the difference between flaky and tender biscuits is mostly technique. I will try to do some testing and get a flaky version out there for everyone to enjoy. Because I am such a cereal lover, I think gluten-free cereals would be great. I know that there are some that are available, but they aren’t that great tasting. I don’t have to be on a gluten-free diet, but I am for trying to reduce some of the massive amount of gluten that we get every day in our processed food diets. Also, I heard that there is gluten in some stamps and labels? Is that correct?? Great question about gluten in stamps and labels. There is some controversy on this issue but it seems that for the most part the rewettable adhesives on envelopes/stamps are made from a corn-based glue that does not contain gluten. This information is from the Envelope Manufacturers Association (http://www.envelope.org/page/6692/). The US Postal Service website appears silent on this subject (although second-hand research seems to indicate their glues are gluten free as well). Thankfully most stamps are peel and stick these days! work on envelopes and stamps, I would think. They say it detects gluten down to 10 parts per million. Your cream cheese pie crust looks good. I actually had your GF pancakes for breakfast this morning. OH MY GOSH!!! Seriously, at first bite, I almost wept. Please be careful, not all Chex or regular Rice Crispies are gluten free. Read the labels carefully. There is a gluten free Rice Crispies that is clearly labeled. Some Chex are ok but some are not. Betty Crocker gluten free brownies are possibly the best brownie, period. Betty Crocker GF chocolate cake mix is wonderful, too. 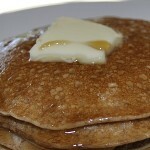 Pamela’s pancake mix is awesome, have served it to guests who never knew. Also, have made pumpkin bread with it and couldn’t tell the difference from my original recipe. It was nice meeting you with Steve & Ruthi and I like your blog. As someone who can eat gluten, but has friends who can’t, I’d like to see a variety of cookie and brownie mixes that I could make for my guests. I like to bake, but having to keep specialty flours on hand isn’t really practical and a good quality dessert mix would help me out. I just wanted to drop a note and tell you I really like your website. You’ve done an awesome job with providing the information and the photographs are beautiful. Keep it up! Your cream cheese pie crust sounds great! Thanks for sharing! I’d love to be entered in your giveaway. Thanks for the opportunity! My fiance and I are on a tight budget so winning this would definitely help us out. I’d also like to make some goodies for friends and family this holiday season and this prize pack sounds like it would be fun to win! I’d like to see any or all flavors of Cheerios gluten-free *Thanks* for the giveaway! For your cheese crackers try Grace Island brand crackers. We love them… They have several different cheese flavors. We like them all. Your pie crust recipe was yummy.. Thanks! Oh, a chance to win! I’d go for some gluten-free biscotti. Your pie crust looks wonderful! Thank You for the great prize package. We received it today and it’s packed full of goodies. Hi Jean Ann! I just got my Mother Earth and they talked about flour made from Artichokes. Have you heard of this? Great Question! I believe you are actually referring to Jerusalem artichoke flour (or sun choke flour). (Oddly enough the plant is not even related to what we know as artichokes.) The flour is fairly heavy, but rich in fiber. I would use it mostly for applications where ability to rise and light texture are not critical, like pasta or a flatbread in combination with other flours. Let me know if you have some successful experiments. How bout gluten free pizza rolls!!!! How about gluten free soft pretzels like Aunt Annies! I’d love to be able to find frozen gluten free pie crusts especially during the holiday baking season — without having to drive 50 miles to a Whole Foods. As of September of this year Kinnikinnick now has a frozen pie crust that appears to be more widely available at various local grocery stores. I have not yet had the opportunity to try this pie crust but the reviews appear to be good. Here is a link to search where it might be available in your area. You can also always request that your local store manager order it for you, you might be helping out others with a gluten allergy in your area. I would love to hear back if you try the product. Happy Holidays! I would love gluten free pancakes! Trader Joe’s has great gluten free pancakes! want to try the recipe, but am curious, do I have to bake before filling? You can blind bake the the crust if your filling is no bake or only a short bake. However, for a pie where you plan to bake the filling (apple pie for example) you can add the filling into your chilled crust and bake together. Is there and way I could ball the dough, chill it and roll it out? So I could have it as a lattice crust?